I picked this up yesterday, and although it bears a distinct resemblance to my Ole Winther Viking decanter I had on here recently, I don't think it's by Holmegaard but it's probably Scandinavian. 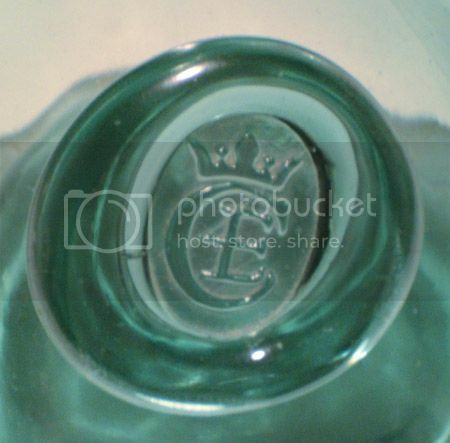 I seem to recall seeing the monogram/logo (or something very similar) on a paper label once, I'm sure, on a Swedish-made kluk-kluk decanter. It was probably 6-8 months ago on eBay. I might be wrong. But that's where my Swedish hunch comes from. Crowned C - first thought ChristinenhÃ¼tte who have a very similar logo but it is not their style. But what about Royal Copenhagen? Were they not in the pool with Holmegaard at one time? Definitely not Plus, it would be marked with their logo on the bottom. I remember reading somewhere about RC & Holmegaard being joined in some way, and I know they shared a few designers, but that's as much as I do know. [Holmegaard] merged with Royal Copenhagen 1985. Amalgamated with Boda Nova-HÃ¶ganÃ¤s Keramik, Orrefors Kosta Boda, & Venini to form Royal Scandinavia. 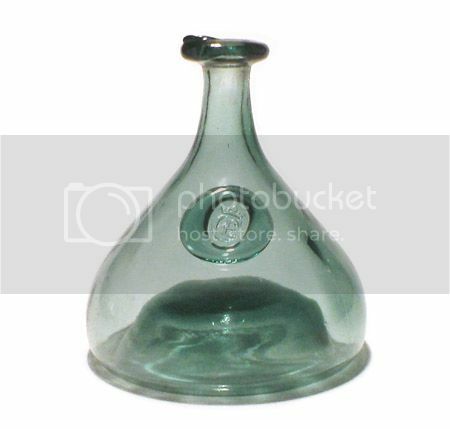 The decanter looks late-1960's/1970's to me, though. Decorative Art Yearbook 1966 has this listed as part of the Viking range by Ole Winther for Holmegaard. Must have been a later addition to it. 20th Century Glass by Andy McConnell says this was designed by Ole Winther for a Danish wine company. The CE is the mark for Cherry Elsinore, a Danish cherry wine. I must have missed this thread before. Ooh, that's fantastic! Thanks for that information, Max.